The aim of the research presented in this thesis is to design the characteristics of an Adaptive Thermal Comfort System for Dwellings to achieve a significantly better energy performance whilst not compromising the thermal comfort perception of the occupants. An Adaptive Thermal Comfort System is defined as the whole of passive and active comfort components of the dwelling that dynamically adapts its settings to varying user comfort demands and weather conditions (seasonal, diurnal and hourly depending on the aspects adapted), thus providing comfort only where, when and at the level needed by the user, to improve possibilities of harvesting the environmental energy (e.g. solar gain and outdoor air) when available and storing it when abundant. What are the most efficient strategies for delivering thermal comfort in the residential sector with respect to better energy performances and an increasing demand for flexibility in use and comfort conditions? 1. The dynamic information of the factors influencing the thermal heat balance of the dwelling was gathered in order to determine their opportunities for adaptivity. A multidisciplinary approach to Thermal Comfort Systems is followed taking into account the dynamic of occupancy profiles, weather, building physics, HVAC and controls. A different approach to the comfort boundaries used in modern standards was introduced, creating insight in the spread in activity patterns and the comfort demand in the context of individual preferences and vulnerabilities. Information of sociology and thermal comfort studies were brought together creating occupancy and thermal comfort profiles for the Dutch situation. By recognizing the differences in occupancy patterns it becomes possible to design adaptive systems to be able to deliver the comfort demanded only when and where necessary in different occupancy scenarios. This is an opportunity to achieve a significantly better energy performance. Furthermore, a method for dynamic analysis of weather conditions related to the thermal comfort was proposed in order to map the opportunities and threats of weather change. This makes the system able to seize upon every reasonably to be expected situation to create an optimal dynamic filter for the outdoor to indoor thermal environment at any time and place. This preliminary study was performed by presuming a simple shelter that can create shielding from wind and solar radiation without any form of thermal storage or insulation. In this study it is emphasised that there is no need for active cooling in the residential sector of the Netherlands if the dwelling is well designed; blocking solar radiation when needed and to allow built up excess heat to be discarded. 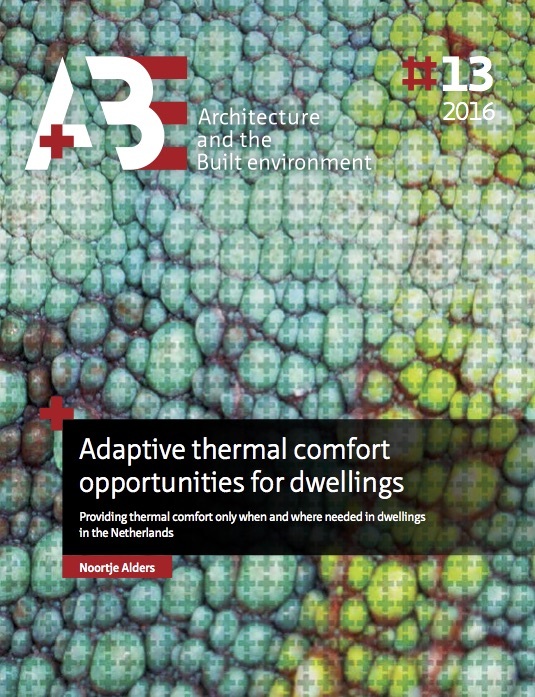 An inventory is provided of the possibilities for adaptivity for a thermal comfort system which are used in common practice and which improvements and new techniques can be implemented to increase these possibilities for adaptivity of the Adaptive Thermal Comfort System. 2. The effect of applying the detailed information and adaptive opportunities framed in step 1 on the energy saving and comfort delivery of the Thermal Comfort Systems was researched. Firstly, the most appropriate calculation methods for the research were determined comparing various levels of detail and approaches in calculation. Control algorithms and strategies are researched. The thesis uses both the lumped capacitance model 3R1C based on the EN-ISO 13790 to benefit from its generic properties to be able to stimulate new concepts for adaptivity of the thermal comfort system to be developed and the TRNSYS model to verify the conclusions from the lumped capacitance model and research the short term practical implementation. The total energy saving potential for heating of the adaptive approach is around 61% on heating demand for the living room and 99% for the bedroom compared to the situation with adaptive thermal comfort delivery (providing heating only when and where needed), minimised ventilation and high insulation values. This energy saving is achieved by adaptive and fast heating and adaptive increase of solar heat gain in case it would be possible in the future to harvest all solar radiation falling on the facade as heat. Applying the variable building characteristics as described the cooling can be eliminated in most situations and will be 10% of the reference situation at most. The remaining cooling demand will be low enough to cancel the need for installation of active cooling. It is most effective to use both an adaptive heat loss factor and solar factor; however, to counter overheating controlling the solar factor is most effective of the separate measures assuming all solar radiation can be blocked from entering the room as heat. In the reference cases the cooling load is significantly lower with higher thermal mass and the heating load does not significantly vary with thermal mass; this is due to the good basic insulation of the dwelling and sufficient solar gain which causes the drop in temperature during the non-heated periods to be very low regardless the thermal mass. The energy saving for cooling by the adaptive strategies is higher with higher thermal mass more drastically reducing the already much lower cooling demand for the references with higher thermal mass. In case of the North orientation it can be an option to build with lower thermal mass because there is significantly less solar radiation available to lower the heating demand; showing a slight increase in heating demand for the higher thermal mass variant. The advantages of adaptive solar shading are significantly lower with the North orientation due to the lower range of solar gain. As the definition suggests the control of the thermal comfort system adaptive to the occupancy and the variable thermal comfort demand resulting from it is an essential part of the Adaptive Thermal Comfort System. This effect is most apparent in the case of adaptive heating; high occupancy means less heating demand than if a standard heating schedule is used because of higher internal gain while the heating demand with control for presence shows less deviation between the occupancy profiles and higher heating demands with higher occupancy. This means that the improvement of energy efficiency is larger the lower the occupancy level. Furthermore, the control algorithm designed in chapter 4 is significantly less accurate in case of the occupancy profile with highest occupancy especially because the temperature falls below the heating setpoint by the time the occupants re-enter the room resulting in higher heating demands than the reference, which can be prevented by prediction of the setpoint temperature. This effect decreases with higher thermal mass because of the slower temperature decrease during the night. Additionally, the occupancy has a great effect on the effectiveness of non-automated systems in case of overheating prevention meaning more effect of automation with lower occupancy rates. This emphasises the need for automated overheating protection by especially solar shading in case of larger periods of absence during the day. The occupancy schedule was used to determine the dynamic demand on which the behaviour and energy saving potential of the adaptive building characteristic are calculated in this thesis. It is not possible or necessary to determine the exact comfort temperature for the occupant. Instead, a range was determined which should be easy to reach in an energy efficient way. Great differences can exist in thermal comfort demand in occupancy of the spaces which makes the application of control according to presence a good way of increasing energy performance for thermal comfort. Relatively simple measures as occupancy sensors connected to the control of the heating can save up to 25% of heating demand depending on the occupancy profile. This thesis confirms the fact that in the Netherlands virtually no overheating problems are caused directly by the weather and that the overheating occurring in dwellings is due to the trapping of heat from incoming solar radiation and internal gains due to minimised heat loss combined with insufficient solar shading and possibilities to discard excess heat. According to this thesis there are some preconditions that will facilitate the functioning of the Adaptive Thermal Comfort System. To ensure the effectiveness of the adaptive ventilation the layout should not hinder the air flow through the building. In case of a heating demand this free airflow can be temporarily disabled by (automatically) closing doors and vents. The ventilation can be aided by designing the dwelling with increased cross ventilation, increased stack ventilation or a "venturi" chimney. To be able to profit optimally from the adaptive solar factor the rooms with the highest heating demand and/or very variable comfort demand should be oriented in the direction where most solar radiation comes from; if possible considering the time of day of the highest heating demand. For energy saving in the heating season it is very effective to apply high insulation values and minimise ventilation to conserve energy together with allowing maximum solar radiation into the room. This can save up to around 80% in heating energy compared to the reference situation with constant ventilation and average insulation value in case it would be possible in the future to harvest all solar radiation falling on the facade as heat. These measures should be combined with adaptive solar gain and adaptive heat loss factor (more easily obtained by extra adaptive ventilation than adaptive thermal insulation) to prevent overheating problems outside the heating season. If it is possible to block all solar radiation this can eliminate practically all need for cooling. The Adaptive Thermal Comfort System increases the stability in air temperature by optimizing the adaptive characteristics for the room temperature to remain closest to the comfort temperature without energy expenses. Therefore, no extra benefit for adaptive thermal mass in an Adaptive Thermal Comfort System is detected. High thermal mass is preferable for a dwelling with an Adaptive Thermal Comfort System as it is for all (sufficiently insulated) dwellings. To save energy in the heating season it is very effective to apply adaptive heating (around 25%); applying heat recovery has a significant added effect on energy saving (around 20% with a heat recovery efficiency of 60%). This needs to be regarded with the extra fan energy needed to operate the mechanical ventilation. Because the temperatures will fluctuate more than with constant heating and cooling the system needs to be able to heat up or cool down quickly, until approximately 6 °C in one hour. The extra energy saving gained by designing HVAC systems for an Adaptive Thermal Comfort System is applying techniques that, besides being energy efficient, can react fast and locally. Using high insulation in winter, high thermal mass and adaptive techniques as proposed in this thesis will stabilise the indoor temperature lowering the required heating speed to below 4 °C per hour with low thermal mass and below 0.5°C per hour for high thermal mass which increases the possibility of applying different heating systems. It is very important to have a high level of automation in the Adaptive Thermal Comfort System because applying high insulation, no solar shading and minimised ventilation at absence of the occupant will lead to overheating problems. The energy saving potential of the automation for the adaptive ventilation decreases significantly for the profiles with least occupancy and lower thermal mass. The loss in effectiveness of the adaptive solar gain is dramatically decreased without automation with an average of 75% less energy saving. The energy saving potential for the combined measures without automation drops with 30% on average increasing the required heat loss factor to discard excess heat. This makes the automation crucial for the Adaptive Thermal Comfort System and mostly for the solar gain. Furthermore, prediction of the setpoint temperature in the near future (for instance with an Adaptive Model Predictive Control (self-learning control) (§ 3.6.4) system) can increase the efficiency of the system preventing the heating load to increase due to rapid temperature drop after a period of passive cooling especially with low thermal mass. The need for cooling can be effectively diminished using the proposed adaptive measures and so the energy saving potential is nearly 100% for cooling. For heating the energy saving is around 25% compared to the reference by applying adaptive heating depending on the occupancy schedule and consequent heating demand and 66% for the living room and 90% for the bedrooms in the 3R1C model if the heat loss is minimised during the heating season. TRNSYS calculates an energy saving of around 45% for adaptive heating. An additional 20% can be saved on heating energy with heat recovery in the calculations with TRNSYS. In the lumped capacitance model it is shown that an additional 20% energy saving can be obtained compared to the TRNSYS calculations by increased solar gain (in case it would be possible in the future to harvest all solar radiation falling on the facade as heat) resulting in a total heating energy saving of around 80% on average.